We saw the new movie version of “Les Miserables” last Saturday afternoon. I’ve never seen the stage show; naturally I know some of the music (there was a concert performance on TV a long time ago, and naturally I remember George Costanza singing “Master of the House” incessantly on “Seinfeld,” and then there was Susan Boyle). I don’t know if there’s anyone who doesn’t know the plot by now, but if you don’t, I don’t want to spoil it for you. But it’s full of escapes and tragedy and deathbed scenes, and if your throat doesn’t tighten up at least once, you have no soul. Let me just say a word about the wicked innkeeper and his wife, played perfectly by Sacha Baron Cohen and Helena Bonham-Carter. (Honestly, what happened to Helena? She was such a fresh-faced young girl back in the Eighties. Then she started playing roles like Bellatrix Lestrange in the Harry Potter movies, and the demented pastry-cook in “Sweeney Todd.” And now this! She probably told the movie’s wardrobe department not to worry about her; she’d just bring her own clothes and fright-wig from home.) Sacha and Helena are a treat whenever they’re on the screen; they’re fairy-tale malevolent, but their stupidity and venality always work against them, and their natural goofiness makes you chuckle every time they come on screen. You’ve probably heard the gimmick of the movie: instead of recording the songs separately, Tom Hooper, the director, made his cast sing right on the spot as they acted. This is an interesting choice; it’s what you get during a stage show, after all, and I think that’s what he was after. Sadly, however, Hooper keeps jabbing the camera into everyone’s face all the time, and it can be a little unnerving. But these are minor quibbles. It’s an epic story, and this is an epic production. The acting is first-rate, and the sets are just the perfect combination of stage-illusion and reality. If it doesn’t get a handful of Oscar noms, je mangerai mon chapeau. So get out there, kids. This is one of the few songs that makes me really happy. 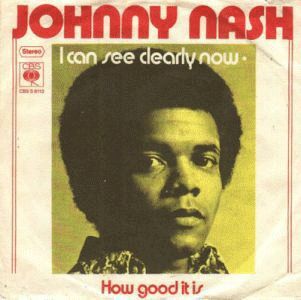 It’s all bright sunny imagery, sung by a guy with a pure mellow voice over a simple cheerful rhythm, with one of those background choirs that sings in exactly the right places. I have written enough about carnivorous plants and poisonous plants. Let’s talk about something more pleasant. 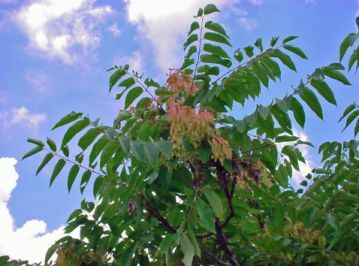 I see the Tree of Heaven (Ailanthus altissima) every summer day in the streets and alleys of Providence. It’s everywhere in the eastern United States, and thrives in cities. It is a weed, believe it or not; it grows wherever it can – up through cracks in the pavement, if that’s all it can find. It can grow six feet a year. I don’t know if you’re familiar with the old book/movie “A Tree Grows in Brooklyn,” but the title tree is A. altissima; it keeps bursting through the street, and no one can stop it. Ah well, we can’t all smell like lilac or lavender, can we? The Chinese use it medicinally, to treat mental illness; the shaved root is mixed with boys’ urine and fermented soybeans, allowed to sit for a while, then strained. The bark contains an acknowledged antimalarial substance. Most importantly of all: I like the tree of heaven. A few blocks from here, there used to be a vacant lot full of ailanthus, at least twenty feet high, in full sunlight. I loved them, though I knew they were squatters and that their time was probably short. Sure enough, they were cut down to make way for a Starbucks. Starbucks coffee cannot be used to combat malaria, or mental illness, not even if you mix it with boys’ urine and fermented soybeans. I would like my grove of ailanthus back. Chinese president Hu Jintao visited the White House this week. Much of the focus was on economic issues like currency manipulation, protecting intellectual property, and lifting the Chinese government preference for contracting only Chinese companies in aerospace and renewable energy fields. The goodwill between our nations was symbolized by a $45 billion export package. Obama addressed human rights only toward the end of his press conference remarks, prioritizing trade, global and regional security, environmental issues, and nuclear proliferation. Predictably, Hu focused on the latter, and discussed human rights only in terms of national sovereignty. Walking through the parking lot of my office the other day, I noticed that the management company has put up those tall orange sticks again, in the landscaping and along the edges of the sidewalks. If you live in a temperate climate, you won’t know what those are for. If you live in a place where snow falls heavily, you’ll know that they’re meant for snowplow season. The sticks are about three or four feet high, so that even if we get a whopper of a snowstorm, the sticks will still be visible above the snow, and the plows can avoid the curbs and the shrubs. It took me well over twenty years to figure out what the orange sticks were for. The property managers put them in place well before the snow falls, usually, so you don’t really make the connection between stick and snow. I grew up in a very temperate place: western Washington state. Winters there are dark and rainy and relatively warm, and snow falls only once in a while. We didn’t need orange sticks in our parking lots. Does it bear repeating that the New England winters are getting less and less snowy, and more and more like those Northwest winters? Here we are in mid-December, when the weather in Rhode Island should be freezing every day, and it was – mm – damp and dark and rainy today. Just like those old rain-foresty temperate winters in western Washington. Also, there are still those damned cherry trees that bloomed a few weeks ago. It’s been happening with regularity over the past few years: the blooming of those insane (or deluded) trees in mid-winter. The world is changing, kids, Mayapocalypse or no Mayapocalypse. There are those who assure us that, even if climate change is happening, it’s not necessarily a bad thing. There’s a Northwest Passage! Saskatchewan and the Dakotas will be like Paradise! And who needs Florida, or South Carolina, or the Maldive Islands, or cares if they’re swamped completely? And who cares if the equatorial regions become uninhabitable? No one important lives there, right? As I’ve said before: I have maybe twenty or thirty years left on earth, if I’m very lucky. I never dreamed I’d say something like this, but: I hope I don’t live to see the worst of it. I’ve seen cherry trees blooming in New England in December. That’s bad enough for me. A gadfly is, by definition, a person who shakes up the status quo. He/she questions the status quo. He/she challenges complacency and accepted wisdom. It’s an important role. Socrates was a gadfly, and died for it. Galileo was a gadfly, and paid heavily for it. However (to paraphrase Monty Python): being a gadfly isn’t just contradiction. It’s something more substantial than that. There are people in the media who pose as gadflies. They do it by saying ridiculous things, and then they defy their audience to contradict them. For example: Joe Kernen on CNBC’s “Squawk Box” on weekday mornings. This isn’t being a gadfly. This is just being stupid. Or, of course, they might perish. “Are there no prisons?” asked Scrooge. “Plenty of prisons,” said the gentleman, laying down the pen again. “The Treadmill and the Poor Law are in full vigour, then?” said Scrooge. “But you might know it,” observed the gentleman. Seeing clearly that it would be useless to pursue their point, the gentlemen withdrew. Scrooge resumed his labours with an improved opinion of himself, and in a more facetious temper than was usual with him. This was Scrooge’s idea of how to be a gadfly. I hope you remember the rest of the story. Partner and I saw “The Hobbit” on Xmas Eve. I’m a big Tolkien nerd, so I couldn’t stay away, but I was dreading it a little too. The “Lord of the Rings” movies were beautifully made, but they didn’t always precisely agree with the way I’d imagined the books when I read them in the 1960s, and it hurt my heart a little. “The Hobbit” is a children’s book. It tells the same basic story as “The Lord of the Rings” – a journey, lots of adventures along the way, spiders, monsters, battles, a distant mountain in the East – but it’s jokey and cute. There are some solemn bits, but they’re solemn in a long-ago-and-far-away fairy-tale way. So the question was: could Peter Jackson take a funny clever children’s book and make something of it that wasn’t just “Lord of the Rings: the Prequel”? The early reviews weren’t great. David Edelstein last weekend said that “The Hobbit” was “our punishment for liking ‘The Lord of the Rings’ too much.” Other reviewers complained of all kinds of things: too fast, too slow, too much CGI, too serious, too long. The only reviewer I saw who liked it was the FT’s Nigel Andrews, who calls it “a sort of masterwork.” He allows that you “have to like looking at folkloric weirdos with beards, hats, and bulbous noses,” and also that the first part of the movie has too many “walkies and fighties,” but it carries you along with it anyway. I am here to tell you that Nigel Andrews was right, and I am the kind of person who likes bulbous noses and pointy hats, and I liked the movie very much. First, however, the bad news: it’s much too long. The book moves along very briskly, so Jackson really had to pump a bunch of stuff into it to make it longer: flashbacks, explanatory sequences, framing devices. He drew, not only from “The Hobbit,” but from “The Lord of the Rings” itself, and its appendices, and lots of other Tolkien material. I didn’t find it tedious – as I said above, I’m a Tolkien nerd, I can name all thirteen dwarves while standing on my head – but I wondered how Partner was dealing with it. Was he overdosing on Middle-Earth? But no! He liked it! So there’s got to be some good stuff there. Are you kidding? There’s a ton of good stuff there. There’s Martin Freeman as Bilbo Baggins, funny and very (ahem) human; Ian McKellan as a (slightly) younger Gandalf, irascible as ever. Hugo Weaving is back as Elrond, and he doesn’t look constipated anymore: he actually looks cheerful at times! And, naturally, you will find Andy Serkis’s Gollum, creepy and sad and horrible, in the movie’s best scene. Jackson departed from the book, naturally, but his choices were mostly good. Bilbo and Gandalf are travelling with a group of thirteen dwarves. How in the hell do you create thirteen distinctive characters all at once and make them memorable? The answer: you don’t. You make maybe five or six of them distinctive, and rely on the rest of them to make background chatter. So we get to know Balin and Dwalin, and Bofur (I think), and Bombur (well, even in the book he’s the fat one), and Fili and Kili. And that’s plenty. But here’s the best bit of all. In the book, about fifty pages along, Bilbo and the dwarves encounter three trolls with Cockney accents. The trolls want to eat Bilbo & Co., and have a big argument over how to cook them. Elbereth bless you, Peter Jackson.